The use of analytics and machine learning in industrial companies and cities is growing rapidly. For more than a decade, the information workhorse has been the business intelligence (BI) platform, supplemented by enterprise manufacturing intelligence (EMI) in the plant. These systems excelled at helping users discover and understand the underlying reasons and details about what happened and why. Now, with the industrial and infrastructure space becoming much more dynamic, companies and cities are turning to advanced analytics and machine learning to support predictive and prescriptive solutions. Today, the analytics market is extremely fluid. More companies are pursuing analytics solutions and more employees throughout the enterprise want more and better decision making tools. And the increasing focus on Industrie 4.0 (I4.0) and Industrial Internet of Things (IIoT) is driving demand for predictive maintenance solutions, which rely on advanced analytics. All companies and cities can benefit from enhanced insights into market demand, operations, inventory, and corporate performance. Analytics provide the information to effectively manage global markets, supply chains, and operations. Artificial intelligence, or machine learning, underlies many now-common consumer products. Netflix recommends what to view; Siri, Cortana, and Alexa respond to voice; and Amazon uses this technology to optimize product recommendations. In the industrial space, we’re seeing considerable interest in using these technologies to optimize asset maintenance, production operations, supply chain, product design, field service, and other areas. Being interested is one thing, but understanding how to obtain and use the technology for a specific purpose is quite another. ARC analysts can work with your team to help select the right technologies for your specific applications. 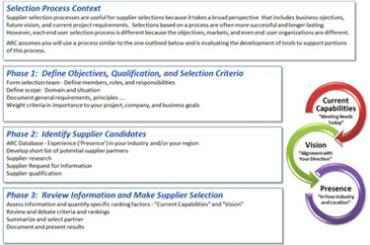 This Technology Selection Guide is designed to help organizations navigate the buying process for advanced analytics.